Hong Kong Thai food and restaurants are easy to find because there is quite a big Thai workforce in this city. The only setback is that the Hong Kong Thai food and Vietnamese (coming soon - link to Hong Kong Vietnamese Food page) restaurants close pretty quick. Once you find one you like, you may realize that it has closed for business a year or 2 later. There are a few areas for you to try it out. It depends on your preference, budget and time. 1) Golden Elephant Restaurant - It used to be located in Times Square. They serve buffet and dishes from the menu. 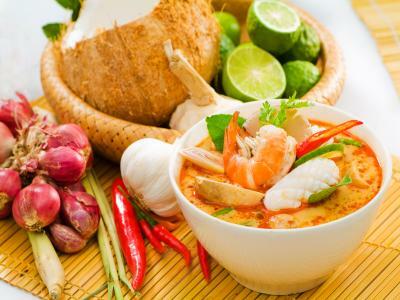 For those who are new to Hong Kong Thai food, with tight budgets and schedules, this Thai restaurant is definitely a convenient place to start with. I couldn't find it anywhere now. But I realized that some of these big chain restaurants may downsize and relocate to some remote areas. I thought it won't hurt to share this information for you in case you see them somewhere. 2) Thai Delight - The very last time I was in Hong Kong, my whole family went here. The renovation and design of this Hong Kong Thai food restaurant is very fusion-like. But the food was absolutely great. 3) Wong Chun Chun Thai Restaurant - Is located in Kowloon City where the Hong Kong old airport(coming soon - link to Hong Kong Old Airport page) used to be. I was there the last time when I was in Hong Kong, too. There are tons of restaurants and mom and pop stores selling authentic Thai ingredients in that same area. This Hong Kong Thai restaurant is always packed with people. It took us 45 minutes of wait for a table which was not too bad for a popular restaurant like this. They have tables in the basement. The setup is a bit crowded. I'm not sure if it was because I was pregnant back then. Although they have a branch that closed by World Trade Centre in Causeway Bay, the one in Stanley provides completely different atmosphere and feel. This Hong Kong Thai restaurant located in the same building of Hong Kong Maritime Museum (coming soon - link to Hong Kong Maritime Museum page) in Murray House. You could choose to sit outside to overlook the Stanley beach. We have been to this restaurant many times and different branches. The food and service are great. Under the same company, they have other restaurants serving different cuisines, such as Spanish. This restaurant chain hires many Filipinos. So, their wait staff can communicate with you in English. If you decide to dine in this restaurant, I would suggest that you head over to Stanley Bay in the late afternoon so that you can check out the Stanley Market, take a nice long walk along the beach, check out the museum if you are interested and dine in the evening. If it's winter time, don't worry. They have outdoor heaters to keep you warm. We were there one time during winter time. It was awesome. Listening to the sea waves and enjoying a great meal. That's not only romantic, but also a great place for a date night.